Vim has existed for 23 years, and it’s been used to write millions upon millions of lines of code. 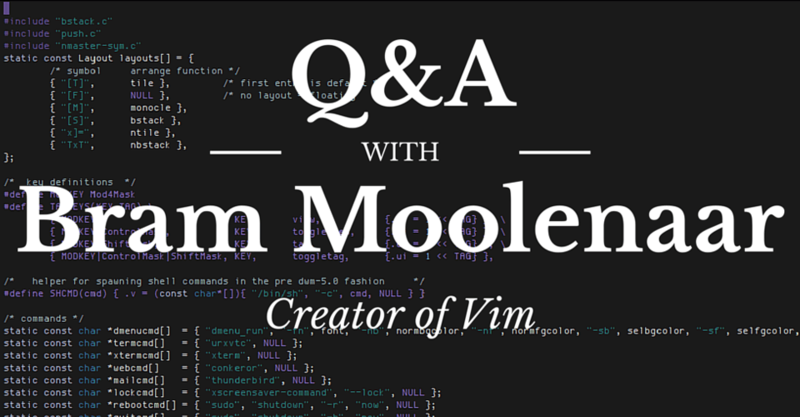 We caught up with Bram Moolenaar, creator of the text editor, to ask him about what he’s learned building it over the past two decades, his thoughts on NeoVim and more. In addition, we posed some questions suggested by the Vim hive mind on Reddit. Check out Bram’s answers below. 1: What have you learned from maintaining such a large and widely-used piece of software for such a long time? I have learned all the different things that one can do wrong. Both my own mistakes and what I find in code from others. That Vim is written in C does not help, since it makes writing bad code easy. Now that computers are much faster and have lots of memory I would prefer a compiler that takes work out of the hands of the programmer. As a hobby project I’m working on a compiler, called Zimbu, that does this. Making sure the resulting code is fast enough that you could write something like Vim with it. Another thing I learned is that one must have a vision for the future. Users often request a small new feature that seems easy to add. Doing this one feature at a time, without considering the direction this is going, often makes it difficult for later features to be easily accessible. For Vim every command has to be assigned to one or two keystrokes. One key is easier to type, of course, thus we need to reserve them for often used commands. But what commands will be added in the future? It’s a bit of guessing I suppose. Although you might also call it a vision. For example, when adding the word object, I decided to use two characters: “aw”. It stands for “a word”. I could have made it one character, but I just knew that other objects would come later. Now we also have “ap” for “a paragraph” and many others. That would not have been possible if “a” by itself would have been used for the first feature that could use it. 2: In a world where many text editors have plugins that introduce Vim-like behavior, what do you feel differentiates Vim from other editors? Put another way: If Vim is the champion of something, what is it the champion of? It requires an investment to learn the Vim commands and keep learning tricks to make your daily editing work more efficient. What Vim provides is the promise that the things you learned will keep on working. Other programs bring out a “new and improved” version where functionality has moved around, and it takes a while before you can work effectively again. Vim, and Vi before it, has set a standard. And you can trust it to keep working on all your computers. 3: Vim is often criticized for having default options which seem counter-intuitive. If you could do the whole thing over again, would you change any of the defaults? Would you change any behavior? This is part of what I mentioned above: Adding one feature at a time. When making changes later, and especially adding features, it may require setting an option to get that new feature to avoid problems with backwards compatibility. For example, multi-level undo makes the “u” command work differently. Thus you need an option to disable the old behavior. There are not many things that I would do differently now though. I would enable more features by default, such as multi-level undo, syntax highlighting and everything triggered by the ‘nocompatible’ option. Basically what’s in $VIMRTIME/vimrc_example.vim. Otherwise, I think a lot of users have their own expectations. It’s easy for a user to assume that others have the same expectations. In practice users have a lot different preferences. So I end up deciding what the default is, and there is always a group of users that will complain. I’m trying hard to make that group as small as possible. 4: NeoVim has been under development for roughly eight months. What are your thoughts about it now that it’s gained some traction? No idea. Some of the basic choices seem odd and irrelevant for the main goals. Such as dropping support for some systems and not being backwards compatible. The goals could just as well been implemented without that. A lot of it feels like someone who doesn’t like the old code and wants to do it “right.” I can agree that the old code is ugly. But it will take an awful lot of effort to make a new implementation. It’s a lot like what happened to Elvis: A rewrite was going to make it much better, but it took so long, during which Vim added more features, that eventually there are not so many Elvis users. And the rewritten Elvis may have nice code, but users don’t notice that. I do hope that the nice things that NeoVim comes up with can be added back to Vim. I mean, who doesn’t want better plugin support, a better GUI and embedding? The big question is how to do that, and who is going to implement it properly. 5: What advice would you give to folks with open source projects when it comes to working with and building a community? Nothing specific. Obviously you both need to set good goals, make some useful code and advertise properly. A nice looking website helps a lot, that’s one thing that NeoVim did right. 6: In your years of working on open source software, what’s one mistake you’d rather not repeat? Without being specific, I have included code from others trusting that it would work, and that they would fix reported problems. And often that is true, there are quite a few faithful contributors. But sometimes someone just wants to get his feature in, and as soon as the things he uses are working, he disappears. And then I end up having to fix problems. These days I’m a lot more careful about including new features. Especially when it’s complex and interferes with several existing parts of the code. I’m insisting more often on writing tests and documentation before including anything. 7: What’s the best way to make open source projects sustainable? Write nice code. Use white space properly, use good names for methods, add comments to explain anything that isn’t obvious, etc. If you write ugly code, anyone who intends to fix a bug or add a feature will not enjoy his work and likely avoid it next time. I’m afraid Vim is not a good example of this. 8: How can the community ensure that the Vim project succeeds for the foreseeable future? 9: Why do you have such a big focus on charity? Why is your charity of choice ICCF Holland, and why is its cause so important to you? We often forget how well we are doing. We complain about the wine not tasting well today or the waiter being rude. This actually means we can afford to buy wine and go out for dinner, isn’t that great? At some point while developing Vim I didn’t have a job and asked for sponsoring. Once I got back to a paid job I thought it would be good to send that sponsorship money to people who really need it. And it turns out Vim users think the same way. There are many charities and it’s not always clear who you are actually helping. How much money stays in the country of the donor? How much gets wasted on administration, transport and other things that do not really help the people who are being helped. One organisation I worked with had only 30% of the money ending up with the child who it was for. Clever bookkeeping makes it look like 90% of the money is used. But a large part of it goes to staff driving around in Land Cruisers. Not to the small school where the child is. The project I encountered in Kibaale is completely different. The foreigners who work there are volunteers, they have sponsors themselves to make it possible to live and work there. All the donations for children go to the project and are spent there. Also for staff and vehicles, but that’s local staff that then spend their money in the country, thus indirectly it helps others. And in the end seeing the children grow up, finish their studies and find a job is wonderful. 10: What does the future hold for Vim? Nothing spectacular. Mainly small improvements. There are a few areas that could do with bigger improvements, such as making it easier to write and use plugins. But it’s not clear how to do that. And plugin managers appear to be filling the gap quite well. But you never know what comes up. For example, the undofile feature seemed like a “nice to have” item. After a student worked on it for a while it wasn’t too much work to include. And now I completely rely on it, being able to make some changes, build, test and undo when it doesn’t work. It’s certainly possible that an idea for a useful feature comes up and gets implemented.